You've got to be shitting me- these are the most popular news stories being emailed around? 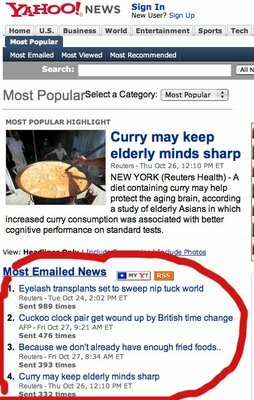 But seriously, are you telling me at 989 people emailed the story about the eyelash transplant to their friends? And did you get a story about curry keeping elderly minds sharp this morning? Cause 332 people did when I last checked Yahoo. Isn't there a war going on? Didn't someone win the World Series last night? 300: Grandma, eat more curry. 32: Don't give grandma any more curry- I need that inheritance! And clearly 60 Minutes this weekend will lead with a story about people in England stuggling with the time change.